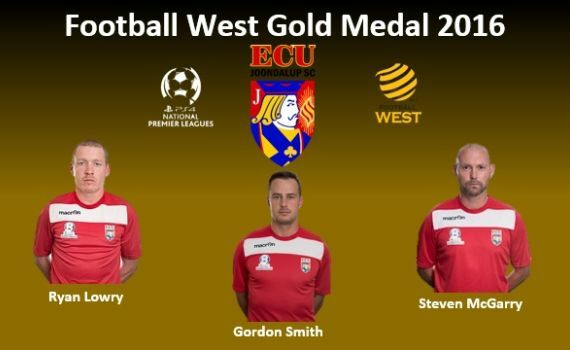 After a stellar season on the pitch, ECU Joondalup players will get their suits out of moth balls when they attend the Football West Gold Medal Night at the Crown Casino Ballroom on Saturday evening. It’s a black tie event and the who’s who of WA Football will be attendance at the competitions night of nights. There has been some outstanding performances from the players this season as the Jacks went close to winning the West Australian Top Four Cup. Gordon Smith will poll well, but the Scottish striker is ineligible after being sent off against Bayswater City in round 9. Ryan Lowry was outstanding all season at the back, along with Steven McGarry and both will poll well. Others in contention are Kevin Moon and Daryl Nicol, after outstanding second half of the season, while Henry Durr, Andy Higgins, Shane Pickering and Tommy Amphlett will also poll. In the goalkeeper of the year Lewis Italiano will go close to winning, while Daryl Nicol and Tommy Amphlett are in contention for Goal of the Season.